Hi everyone! Hope you all had a fabulous weekend. I spent most of my weekend at home as I wasn't feeling so well. This gave me the opportunity to catch up on some of my recorded shows such as 'Revenge', '90210' and 'Scandal'. I am watching the first season of 'Scandal' and I am already hooked. What shows do you guys watch or record on your DVR? I need to add more interesting shows to my list. The rainy and gloomy weather made me sleepy and thanks to this cute puppy sweater from JCrew for keeping me warm ;) Styling an outfit with a neutral base like the plaid JCrew pants is always safe. When wearing neutral tones I always imagine black colors because it makes it easier to select accessories to complement. Using the pants as a styling focus, I incorporated items based on its striped details. Since we are in the fall season, I wore the charcoal motif sweater for warmth and a black zara bag to complement. The burnt orange belt adds a touch of color without taking away from the pant details. I completed the look with beige pumps that tie the neutral tones. Oh! You look so chic! I'm in love! I love, love, love the sweater. You are working the plaid -- not many can pull it off! Gorgeous ! I never get enough of those shoes. They take your outfits to another level ! Love how you picked up the colours from the pants in the sweater. Such a lovely outfit! The sweater is so cute. I hope you feel better now. Revenge is one of my favorite shows, btw. Very comfortable and chic. You look cute! Now, onto one of my favorite topics - TV! Shows that I'm currently watching/DVR-ing are Parenthood, Scandal, Revenge, Modern Family, Nashville, Happy Endings and Last Resort. I have a couple of shows that are coming back starting next year like American Idol, SouthLAnd and Game of Thrones. Oh I do hope that you are feeling better! To be honest, I am not much of a TV person, but my husband and I really got into Sons of Anarchy and even though I am a drama-wuss, I am HOOKED. I love love LOVE your plaid pants with the adorable puppy sweater! 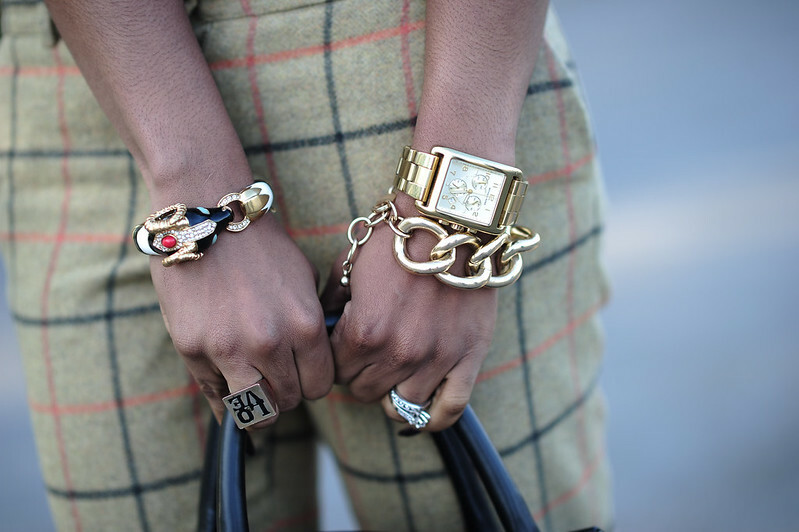 love your pants and accessories. Also I really want to Pin this outfit, but your page isn't letting me Pin it. :-( It says none of the images are available to Pin! CBS has a great Thursday prime time line up. Loving the print mixing; those pants and the sweater are great pieces both individually and together. Love the pants and the bag not forgetting the Arm Candy! OMG amazing pants and so well combined with that cute jumper! The sweater is super sweet and I love the plaid pant! @ Vivi: You watch a lot of shows. I have to try and keep up with you. I am not sure I'm that interested in seeing Nicki Minaj on American Idol. Anyway, I want to start watching 'Nashville'...I heard it is good. @Frannie: Sorry about that, I hope the 'pin it' is finally working for you now. I was able to pin it. @Fridah: OMG! I watch 'Vampires Diaries' too, but I am still in season 3. I just started watching 'Grimm' thanks to my friend V. For 'Pretty Little Liars"...I couldn't get with it. @Abi Toye: My husband watches "Big Bang Theory", but I can't get with the show lol. We don't have Smart Set in the States. You look stunning! I am so in love with your slacks! Love this mix. I have to invest in a fun sweater. When I saw the doggy sweater ... lovely look :) TV ... hmmm - I've gone through a British crime phase (Cracker; Luther; Blue Murder, to name just a few), and now I've moved to Danish (w/ subtitles - The Protectors) and Canadian (Flashpoint), w/ vintage American (Peter Gunn). But it's not all crime time! Also have watched Pretty Little Liars ... I realize it falls in the genre of "fashion tv", but if there isn't a good story, I'm outta there!